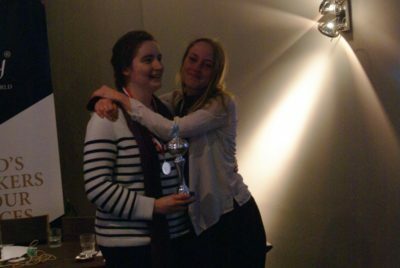 The team Merkel II & III (Lisa Knodt, Katharina Jansen) of the Rhetorica Debating Society Maastricht has won the Erasmus Rotterdam Open 2019. Out of Opening Opposition, they defeated the Opening Government Glorious like the Mongolian navy (Milla Huuskonen, Markus Myllymäki; Helsinki), Closing Government Tudor and Anne (but not Henry and Boleyn) (Tudor Musat, Ana Coman; Cambridge/Bukarest) and Closing Opposition We beg you to propose. That’s what she said. (Elizabeta Korenčan, Roel Becker; Llubljana/Leiden) on the motion “Assuming the technology exists, TH supports the use of augmented eternity for people in highly influential positions (e.g: top academics, researchers, CEOs or politicians)”. The final was judged by Matt Hankin (chair), Daan Spackler, Huyen Nguyen, Ishaan Kapoor, Klaudia Maciejewska, Marius Hobbhahn and Ron Leizrowice. 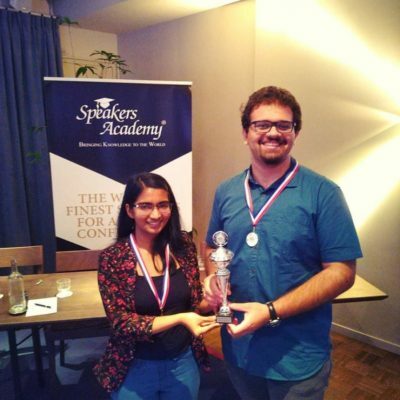 The novice final was also won out of Opening Opposition by the team They Who Must Not Be named (Abhratej Sahoo, Priya Sarkar; Delft) against The case for Limburg (Adi Berko, Lena Maas; Maastricht) in Opening Government, TU Delft> ERU. Change my mind (Kriharen Tiagoo, Sheharyar Ali; Delft) in Closing Government and Copenhagen 1 (Kristian Olsen, Nick Rehn; Copenhagen) in Closing Opposition. The debate on the motion “THR the Goldwater Rule” was judged by a panel of Ron Leizrowice (chair), Daan Spackler, Jan-Gunther Gosselke, Jelte Schievels and Lisa van Vliet. Best speaker of the tournament was Roel Becker with an average of 81.40 speaker points. In the novice category, Kai Xiang Teo from Leiden reached the top position with 77.00 points on average. 1. We beg you to propose. That’s what she said. (Elizabeta Korenčan, Roel Becker; Llubljana/Leiden) – 13 pts | 806 spks. Breaking as judges were Calyxx Peucker, Cian Jansen, Daan Spackler, Emma Lucas, Helena Hecke, Huyen Nguyen (CA), Ishaan Kapoor, Jan-Gunther Gosselke (CA), Jelte Schievels, Klaudia Maciejewska, Lars Velthausz, Lisa van Vliet, Lucía Arce (CA), Marike Breed (CA), Marius Hobbhahn, Mark Wilson, Mateusz Wójtowicz, Matt Hankin and Ron Leizrowice. The tournament was organised by the Erasmus Debating Society in person of Lena Martinovic, Marija Mamuza, Teona Banu, Samuel Klačman and Lokyin Tsang. Responsible for the tab were Annemarijn Tamminga and Marija Mamuza while the CA panel consisted of Marike Breed, Lucía Arce, Clíodhna Ní Ch, Jan-Gunther Gosselke and Huyen Nguyen acted as Chief Adjudicators. Matt Hankin and Stephan Loor acted as equity officers. R1: THW forcibly take owernership of privately-owned homes which are not lived in by their owners during periods of national housing shortages. R2: Infoslide: Geoengineering is the deliberate large-scale intervention in the Earth’s natural systems to counteract climate change. Proposed technologies include, but are not limited to, solar technology to reflect the Sun’s energy back into space, attempts to remove CO2 from the atmosphere, and technology to cool oceans. This strategy stands in opposition to mitigtion strategies like subsidising green energies or pollution-reduction initiatives. THBT, instead of attempting to mitigate the effect of climate change, states should re-divert all existing environmental funding to geoengineering projects. R3: Infoslide: In August 2016 the Colombian government and the guerrilla group Revolutionary Armed Forces of Colombia (FARC) agreed to a historic peace treaty, ending a 50-year conflict. Amongst its conditions, it allowed guerrilla leaders to run for office, gave the FARC state funding to form a political party, and it both allowed regions whom the FARC claims to represent to elect additional representatives in Colombian elections and awarded the FARC 10 guaranteed seats in Parliament for the first two election terms (from 2018 to 2026). THR the decision to let the FARC run as a political party. R4: Infoslide: Companies like Apple, Amazon, Google, and Facebook own ‘platform utilities’, such as app stores or search engines. that allow users to access content. Those same companies also advertise their own products e.g. Google-owned webpages, Apple apps, and Amazon products on these platform utilities. When tech companies own platform utilities and platform products, THW break them up. R5: Infoslide: Protectionism is the economic policy of restricting imports from other countries through methods such as tariffs on imported goods, import quotas, and a variety of other government regulations. THS protectionism in developing countries. SF: THBT social justice movements should not actively try to appeal to allies (e.g. the feminist movement deliberately trying to appeal to men, or the LGBT+ movement to straight cis individuals). NF: Infoslide: Since 1973, the American Psychiatric Association’s Goldwater Rule has instructed psychiatrists not to speculate on the mental health of public figures whom they have not examined. The Rule is widely-followed, and similar norms exist among other mental health professionals. F: Infoslide: Augmented Eternity enables one to create a digital persona/avatar that can interact with people on one’s behalf, even after one is dead. This can be done by amalgamating a mass amount of personality data about the person and simulating such experiences. Assuming the technology exists, TH supports the use of augmented eternity for people in highly influential positions (e.g: top academics, researchers, CEOs or politicians).